Hello, this is Michiyo, sales representative. a globally recognised gastronomic event was held in Singapore. in London presented a Japanese course dinner at Tóng Lè Private Dining from the 6th till the 10th. 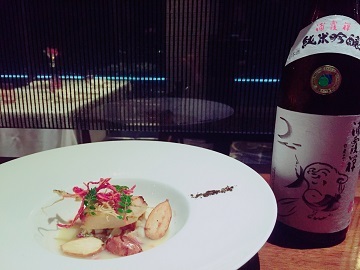 and our "Junmai Ginjo Urakasumi Zen" was chosen to match with the dish. towards disaster hit areas and how the areas are recovering. I was happy to get good feedback for "Urakasumi Zen"
and have received a letter of appreciation from the organizer. I would like to thank World Gourmet Summit and to Chef Ishii for the great opportunity. 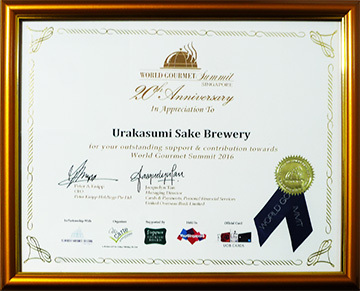 Urakasumi will further strive to deliver quality sake to the world's top chefs and to consumers. Copyright(C)2019 URAKASUMI Saura Co., Ltd. All Rights Reserved.